Fan Voltage Independent of TC648 Supply Voltage - Supports Any Fan Voltage! The TC648 is a switch mode fan speed controller for use with brushless DC motors. Temperature proportional speed control is accomplished using pulse width modulation(PWM). A thermistor (or other voltage output temperature sensor) connected to the VIN input furnishes the required control voltage of 1.25V to 2.65V(typical) for 0% to 100% PWM duty cycle. The TC648 can be configured to operate in either Auto-Shutdown or Minimum Speed mode. In Auto-Shutdown mode,fan operation is automatically suspended when measured temperature (VIN) is lower than a user-programmed minimum setting (VAS). The fan is automatically restarted and proportional speed control restored when VIN exceeds VAS (plus hysteresis). Operation in Minimum Speed mode is similar to Auto-Shutdown mode, except the fan is operated at a user-programmed minimum setting when measured temperature is low. An integrated Start-Up Timer ensures reliable motor start-up at turn-on, or when coming out of Shutdown mode. The over-temperature fault (OTF) is asserted when the PWM reaches 100% duty cycle, indicating a possible thermal runaway situation. 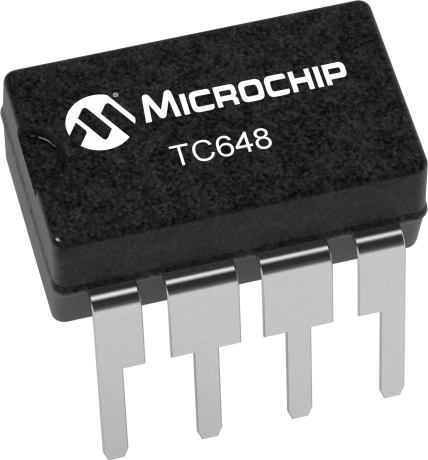 The TC648 is packaged in a space-saving 8-pin plastic DIP, MSOP or SOIC package and is available in the industrial temperature range.